"What stunned the Parisian audience (apart from the few who judged her obscene) was her extraordinary energy. Every part of her body seemed to fly in a different direction. One critic was awed by 'her springing movements, a gushing stream of rhythm,' while the more sophisticated had brought to mind Rousseau's apotheosis of the Noble Savage. The poet Anna de Noailles saw her as 'a pan­theress with gold claws,' a symbol of the most primitive sensuality. 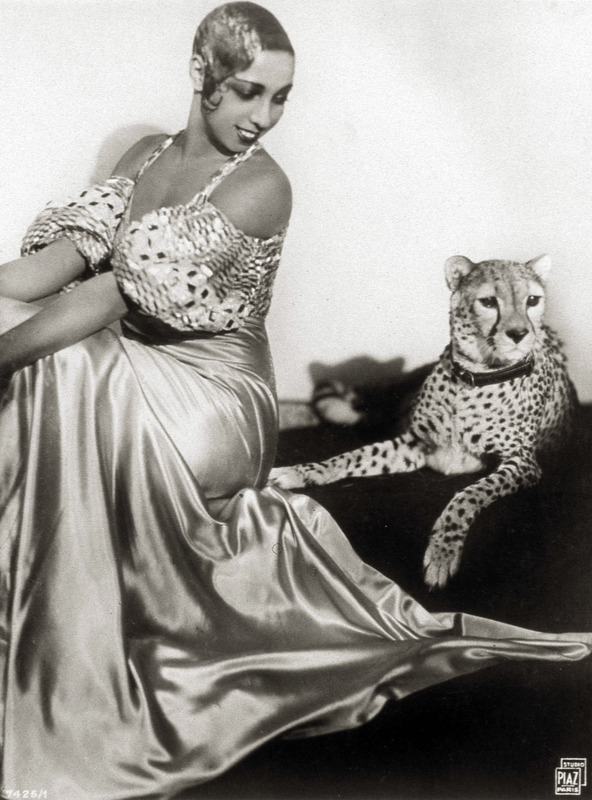 Boulevardiers became accustomed to seeing Josephine and her pet leopard, Chiquita, stalking, side by side, down the Champs-Elysées -- two superb animals out of the same jungle -- and they cheered her. Paris loved her style. "What truly stole Parisian hearts, however, was when Josephine took to song. "The trilling tones come down the years, evoking that frenzied age of brief, elusive pleasure, that short period of illusion called Peace -- the spirit of Paris in the 1920s and 1930s. Sung in a high-pitched warble, with an unashamedly Churchillian accent, her 'La Petite Tonkinoise' ('C' est moi qui suis sa petite ...') became the anthem by which everyone remembered the Paris of those years. But it was her nostalgic, highly emotive 'j'ai deux amours' ('mon pai-yee et Paree'), proclaim­ing her special bond with the city and sung a thousand times over, that seduced audiences and hard-boiled critics alike. "Josephine's love-life was as uninhibited and frenetic as her stage perform­ances. She would dance over twelve hours a day, then make love all night; she had a legion of casual lovers, including the unstoppable writer and sexual braggart Georges Simenon. Her curiosity seemed boundless; reputedly she made love to the room-service waiter in the first Paris hotel she stayed at -- to discover what French men were really like in bed. Of Parisian voyeurism she would remark scathingly, 'The white imagination sure is something when it comes to blacks!'"